I made this word image using Wordle. I can really see the kids using this poster to try and guess some titles that each author wrote. I also think it would look really nice in the library. 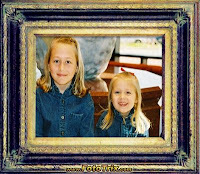 I made the framed picture of my girls using Image Chef. Loved this site! You can do many more things, too. The smiley face image was created from Smiley Generator. What I liked most about this one is that it was cute, quick, and easy. I can see myself using this alot on either my library website or my newsletters to teachers/parents. Last but not least, I created the wanted sign by using two different sites. I found the photo in the Creative Commons portion of Flickr. 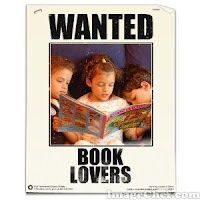 I saved and uploaded it to the sign generator to make the wanted poster. I think the uses for these sites in the library are endless. I created the images you see here for a variety of uses. 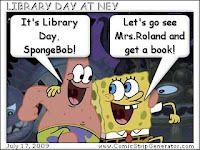 I can also see the kids using these sites to make book posters, comic strips about their favorite book/character, frames around their pictures for research papers, etc etc. The list could go on and on! I bet your daughter will come up with ideas we haven't even thought about! Hope you two have lots of fun together!